Take advantage of all that SASC has to offer for an annual membership fee of just $25! 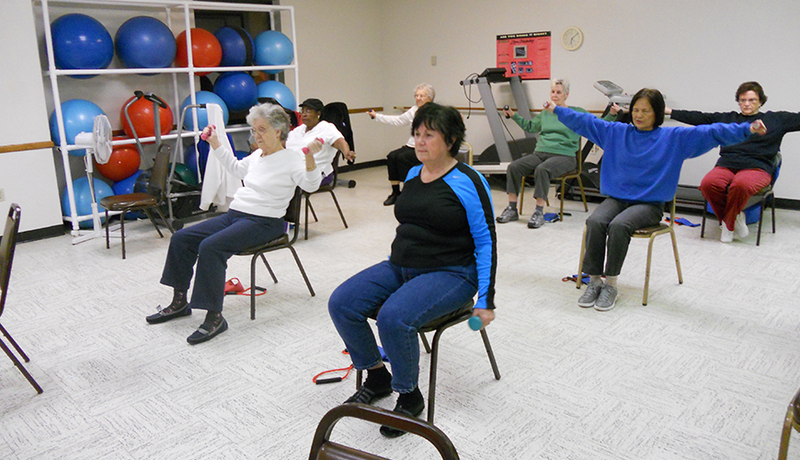 Many physical fitness programs are offered throughout the day and evening. We have on-site instructor-assisted classes in our exercise studio equipped with treadmills, bicycles, weights and balls. We also offer off-site swimming and sports tournaments. Arthritis Foundation approved aquatic program offered off-site with transportation to and from site. Join us on one of our social and recreational day or overnight trips, which include malls, beach trips and casinos. Bring a friend! Don’t stay at home! Come play with us! Transportation is provided to and from SASC Monday through Thursday, as well as to grocery stores, banks and medical appointments just to name a few. Nutritious lunch and Evening meals served to anyone 60 years of age or older, for a modest donation of $2.00. Guests who are under 60 are required to pay $5.25 per meal. That’s still a good deal for a great meal. SASC offers salon services at reasonable prices. Make an appointment and try a new look today. Cards and gifts for all occasions are available. Several Volunteering opportunities are available upon request such as working with our Sunshine Group -our party planning committee, gift shop, meal registration and donations all of which are supported by the Retired Senior Volunteer Program of New Castle County. All of St. Anthony Community Center's Senior Center Activities and Events are handicap accessible.